Diseased plants become less likely in a garden that has healthy soils, hospitable habitats and well-chosen varieties. Maintaining those conditions is obviously important too, as a stressed plant is more susceptible to disease. The majority of plant diseases are fungal or viral and occasionally bacterial e.g. fireblight. Plan for enough room to accommodate full-grown plants: water evaporates more slowly in crowded conditions and air doesn’t circulate well. Water garden beds deeply and then allow the top level of soil to dry out before watering again. Water around the base of the plants, not onto the leaves. Use free-draining mulches that won’t harbour moulds and spores. Strengthen susceptible plants with silica based sprays e.g. equisetum. If diseases do appear, remove afflicted leaves or plants, wash hands. Use sprays but avoid copper which is being removed from organic standards as it accumulates in the soil. Tell-tale signs of viral disease are stunted and deformed plants. Other symptoms include mottling other strange markings on foliage, and bizarre colourings on flowers. Viruses are highly infective, often spread by insects, by cuttings or simply by handling. Pull out affected plants and burn or remove from garden completely. DO NOT compost them. In the organic vocabulary weeds have variously been described as “plants out of place”, “plants whose virtues have not yet been discovered” and “Nature’s first line of soil defence”. The tradition of leaving fields fallow was to allow “weeds” and wildflowers to regenerate the soil depleted by crops. Covering bare soil to protect it from wind, rain and erosion. Indicating and trying to heal problem soil conditions e.g. deficiencies, acidity/alkalinity, too wet/dry. Retrieving minerals from the subsoil, particularly where topsoil is depleted. Storing nutrients that would otherwise be washed, blown, or leached away. Weeds will always be with us. They were designed to survive and remedy inhospitable conditions and you may be happy to live with a few, especially those that have multiple uses e.g. dandelion and comfrey. Mulching to deprive weeds of light; all plants need light to grow and seeds need the sun’s light to germinate. If you must dig, try doing it at night! German researchers found that night tillage resulted in as little as 2 percent weed cover with no herbicides, while traditional daytime tillage led to 80 percent weed cover. Mulching also conserves moisture and builds soil as it decomposes. See p 30 for mulches. Planting crops close together or using leafy or dense cover crops, including green crops, to shade weeds out. Avoiding soil compaction caused by walking on soils and working them while they are wet. Getting them early – pull or hoe weeds regularly before they establish, and especially before they reproduce. Using allelopathy. Some cover crops, such as rye grass and buckwheat, release phytotoxins that kill or inhibit other species. Hot composting or otherwise removing seeding weeds. Preparing seed beds in warmer climes two weeks before desired planting date. Cover bed with plastic to warm soil, allow weeds to surface over two weeks and then hoe, leaving them as mulch. Then sow seed. In colder areas raise seedlings in trays and transplant rather than sowing seed. 25 percent of weed seeds are estimated to be still viable after 1 years buried two metres or more in the soil. Some weed seeds are still viable after lying dormant in the soil for centuries. Common weeds, such as dandelions, purslane and lamb’s quarters – are nutritious additions to salads. Harvest when young, use the tender leaves to eat with other greens – discard the roots. These common weeds tell you about the condition of your soil and are often trying to remedy a problem. Baking soda Fungicide Mix 1 tsp baking soda, 1 tsp soft soap, 1 tsp cooking oil, litre water. Spray on foliage. Chamomile tea in boiling water Fungal diseases, especially Teabag or cupful of flowers to 1 litre water. Cool then use, damping off. Chicken, cow, horse manures Liquid fertiliser Steep 1 kg manure in 10 litres water for 1 month. Dilute to colour of weak tea. Cider Vinegar Tonic, fungicide 1 tablespoon apple cider vinegar to 1 gallon water. Spray. Compost tea Foliar leaf fertiliser. Preventative measure against fungal disease e.g. early orlate blight Mix half a bucket compost with half a bucket water. Stir every 2 days until liquid is mahogany coloured. Strain. Spray plants once a week. Eggshells Calcium Tonic – good to prevent blossom end rot Crush and sprinkle around base of plants, or make a tea – crush 12 eggshells in 1 litre water. Leave overnight. Iron nails Deter cutworms Sow a few iron nails in the soil. Milk Powder Anti-viral, fungicide, tonic 1 tablespoon powdered milk worked into soil when transplanting, then 1 tablespoon per week watered into soil. 1 tablespoon powdered milk in 1 litre of water (equal fresh milk and water) as foliar, fungal spray. Molasses, seaweed and milk powder Foliar spray. Fungicide 1 cup molasses, 1 cup seaweed powder, 1 cup milk powder. Dissolve in 1 gallon of water. Use as foliar spray. Nettle 1 Liquid fertiliser Pest control 1 kg fresh cut nettles, 10 litres water. Cover, leave at room temperature 14 days. Stir every other day. Strain, use undiluted. Nettle 2 Pest control 100g nettles, 1 litre water, leave 24 hours. Strain, dilute 1.5 with water. Seaweed/fish Foliar feed, fungal and pest control Foliar spray of liquid seaweed or fish emulsion every 1-2 weeks. 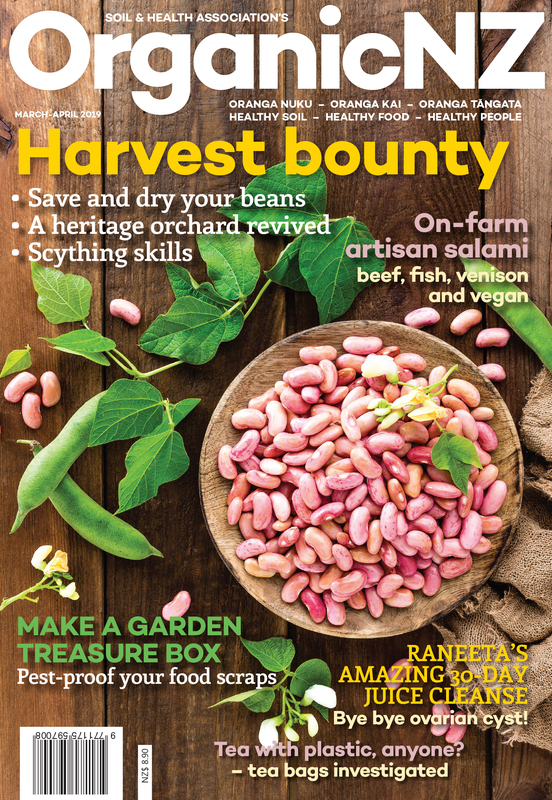 Content from Organic Gardening – A Guide by Organic NZ, published by the Soil & Health Association.